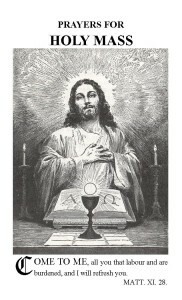 This prayer card is truly a beautiful way to meditate during the Holy Sacrifice of the Mass. You are brought in to share in the Passion as it is happening on the altar. You will be profoundly moved by this devotion. I also want to recommend – highly! – your wonderful pamphlet, “Prayers For Holy Mass”. Thank you so much for including one of those as a gift with my previous order of your Psalter books! I didn’t know you had them; otherwise, I’d have ordered them with the Psalter books. I guess I was so excited to be getting more of the Psalter books, I failed to look at any of your other publications. My order has been placed for 10 of them, and I wish I could afford 100. The “Prayers For Holy Mass” booklets are worth their weight in gold, as are the wonderful “Our Lady’s Angelic Psalter” books. I have already distributed several of the Psalter books, and the 1 booklet, “Prayers For Holy Mass”, that I had. This went to a sweet 18 year-old girl who is in the beginning stages of what seems to be a genuine, on-fire conversion, and she was very grateful to get the Rosary and Mass Prayers booklets. As with so many, most do not realize that the Holy Mass *truly does* re-present Calvary to us, let alone *how* it does so. Yours is a badly-needed service in this foul sump of a world. Keep up the Good Works, I beg!